But if you work for an awesome practice like me, you'll most likely get a generous stipend + time off for conferences in some pretty cool places. This year I traveled to Colorado Springs for a Maui Derm conference. It's my first conference with Maui Derm, and my fellow co-workers have raved about these conferences. With it being held in Colorado, I couldn't resist. After the conference I drove west into the mountains to hike Mount Elbert - the highest mountain in the North American Rocky Mountains, and the second highest mountain in the Continental USA. The conference was held at The Broadmoor - an absolutely beautiful luxury hotel in Colorado Springs. The conference offered great lectures- new guidelines, new medications, new approaches to diseases (I'd recommend to anyone to dermatology) ... but they were long days, with lectures starting at 5:45am and going until 5-6pm, so I was more than ready to drive out west and get some hiking in. When I lived in Colorado many moons ago, I hiked a handful of 14'ers (mountains over 14,000 feet), but I never did the highest peak, something I've always wanted to do. So this was the perfect opportunity to check it off my bucket list. Mount Elbert is the highest point in the Rocky Mountain Range, standing at 14,433 feet. 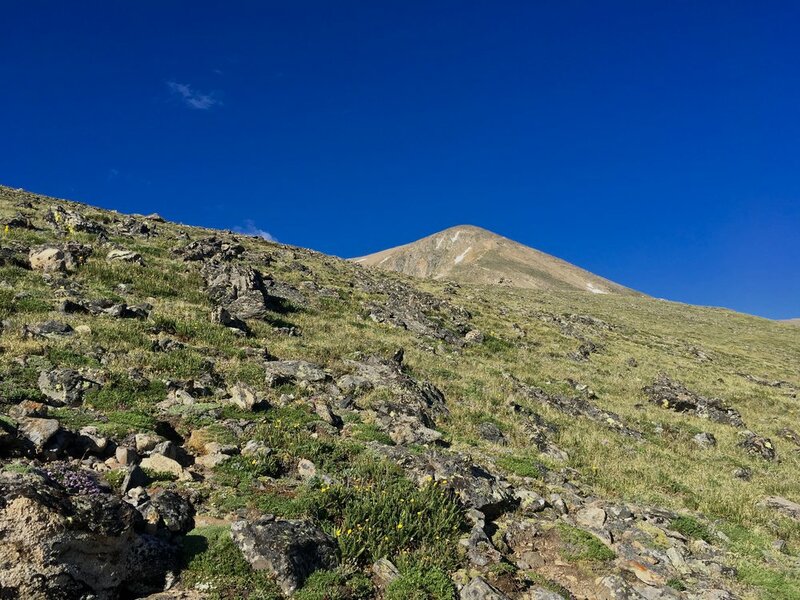 It's in the Sawatch Range, located in the San Isabel National Forest, about 12 miles southwest of Leadville, CO. Click here to get the best directions to the trailhead. If you're hiking peaks this high, it's important to start out super early, so you're off the peak by the time any afternoon thunderstorms roll around. I started hiking just before 6am, summited just after 10am, and got back to the trailhead just after 1pm, for a total of 7 hours round-trip (pretty typical for the average hiker). What makes this mountain a mental game is how many "false summits" it has. Every time you think you're seeing the summit, another one comes into view. This hike was probably one of the most challenging physical things I've asked my body to do. Despite it being relatively short in distance, it was a huge elevation gain, and coming from the east coast, my body wasn't adjusted to the altitude. I definitely dealt with some Acute Mountain Sickness - nausea, dizziness, lack of balance, and some pretty significant swelling of my hands and feet. Some people had it worse than me - two people I passed were vomiting / dry-heaving, and quite a few people had to turn around. I climbed the last ~1,000 feet with three local guys (misery loves company) - so I suckered them into taking photos of me at the top. There was also a group of college guys at the top running around naked and shotgunning beer. Sunscreen is a MUST if you're at high elevations. When I'm hiking I always do my daily morning application, apply again right before hiking, and make sure to pack my sunscreen in the brain of my pack for re-application ( if you're sweating, your sunscreen is coming off ). Most people apply only a quarter of the sunscreen they need for appropriate photoprotection. A good rule of thumb is to apply a nickel-sized amount for the face. The American Academy of Dermatology recommends at least SPF 30, with broad-spectrum protection (meaning it blocks both UVA and UVB radiation). This stuff is so protective because it's formulated with over 21% zinc oxide - meaning it's thick & pasty, but offers some of the best photoprotection out there. Use this stuff on days you know your UV exposure will be increased. LOVE this stuff for both face and body - it smells SO GOOD. And it definitely lives up to it's claim of "non-greasy" - it has an almost cream-to-powder formulation. Purchase at Ulta for $15.99. Simple - drink water! This is also important to ward-off altitude sickness - drink before you're thirsty, and then drink a little bit more. The mountains of Colorado lack humidity, which can make your skin look and feel dry and flaky. You might notice your skin needing more moisturizer. When I visit Colorado I don't even bring my lightweight, daytime moisturizer - I just use my normal night cream during the day for added moisture, then apply sunscreen on top of that. You can apply a serum before your moisturizing cream for extra hydration. It's important to remember that your lips need SPF just as much as your skin does. We can grow freckles as well as precancerous and cancerous lesions on our lips. I've blogged about this before - it's good stuff, and won't make your lips ghastly white and pasty. Purchase at Sephora for $24. I'm a fan of using a skin protectant under SPF if you're in a harsh climate. A skin protectant is essentially a topical cream / gel / lotion / ointment with an active ingredient that helps create a protective barrier against external irritation. There are a few different types of skin protectants - the most common are probably colloidal oatmeal (my personal fav), dimethicone, and petrolatum.